Pets are adorable and are good company to have around the home, but cleaning up after them can often be a difficult task, especially if they shed a lot of hair. In this instance, you need a handheld vacuum that is specialized in cleaning pet hair as they will have the right tools and power to tackle the issue. You may also want to see our comparison chart for the best handheld vacuum cleaners for pet hair. Here are our top 5 best handheld vacuums for pet hair. BISSELL has a few vacuums dedicated to cleaning pet hair, but their most popular model is the BISSELL Pet Hair Eraser 33A1, which is a bestseller on Amazon and one of their lowest priced and best value handheld vacuums for pet hair. First impressions are that it’s very compact which makes it easy to carry around, and features a rather wide mouth for a small vacuum. The flexible rubber contour nozzle is effective in removing dirt and pet hair from carpets and upholstery. It also comes with a hard nozzle, used for cleaning dry messes. It is a corded model, but the cord is 16 foot long which is a good length. The HEPA Media filter ensures that all harmful elements in the air are trapped and filtered during vacuuming, which is important when dealing with pets. Many users of this product are very impressed by the power this handheld vacuum can produce, which is surprising for such a lightweight and small device. The Dyson DC44 Animal (read the full review here) is probably the most expensive bestselling handheld vacuum designed for tackling pet hair, as well as general use. It’s jam packed with technology and various tools and features. Boost Mode: Gives you the option of either having 20 minutes of constant high power suction or 8 minutes of even higher suction power. 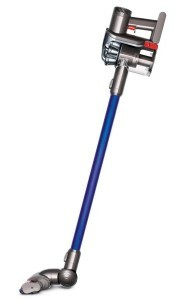 Detachable Long-Reach Wand: Made from aluminum and allows you to reach into far and difficult areas. Motorized Floor Tool: Features two types of brushes – Anti-static carbon fiber filaments which removes fine dust from hard surfaces, and hard nylon bristles for removing ground-in dirt from carpets. It’s packed with more features than we can put in such short space, but at the moment, the Dyson DC44 Animal appears to be the most powerful cordless handheld vacuum on the market. One of the more premium handheld vacuums for pet hair is the Hoover Platinum LINX Pet BH50030 (read full review here). It features a longer and larger design than many other hand vacs, but do the features justify its size? 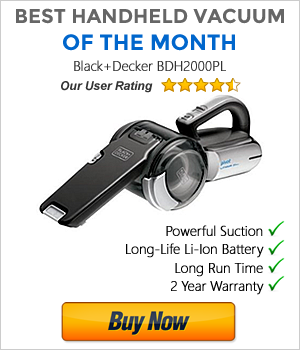 First of all, this is a powerful handheld vacuum as testified by hundreds of users. This means that it needs a capable battery to match its power. Fortunately, it has an 18V Li-Ion battery which can be detached and replaced when it comes to the end of its life. And its life should last long since its Li-Ion battery is known to hold its charger without fading. Power Head Brush Roll: Flexible cleaning due to the 25 degree pivot. Pet Upholstery Tool: 3 rubber blades used to attract pet hairs. Deluxe Dusting Brush: Dual row gentle bristles for dusting delicate surfaces. Each attachment covers a large surface area and has its own purpose. If you’re looking for quality, power and a general/pet hair hand vac designed to last, then the Hoover Platinum LINX fits the criteria. 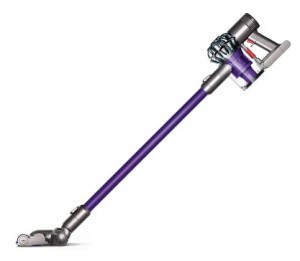 If you’re looking for a cheaper alternative to any Dyson Animal vacuum, then look no further than the Shark Rocket Ultralight Upright HV302 (read the full review here). Although not as powerful, it has infinite cleaning time and will never lose its suction power since it’s powered by a 30 foot cord. It has a hard floor attachment that has the ability to clean bare floors as well as an effective motorized brushroll that will deep clean carpets, swivel steering to maneuver around your home easier and comes with a multitude of attachments for any cleaning purpose. It’s cordless, versatile and delivers long lasting power that’s likely more powerful than any other handheld vacuum you’ve ever used. Its integrated technology is simply unrivaled. The Dyson DC59 Animal (read the full review here) is not for you if you’re on a budget, but if you want the best specs, then you’ll be impressed with 22.2V Lithium Ion battery, 26 minutes run time (6 on Boost mode), 28 air watts of suction power (an astounding 100aw on Boost mode) and a variety of high quality attachments for cleaning any area or surface. 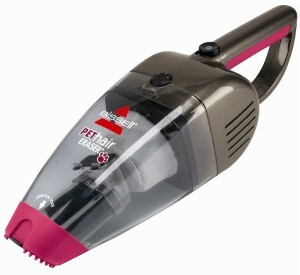 You may also find our Best Handheld Vacuums For Pet Hair Comparison Chart helpful. The below pet hair vacs were featured on our list previously but have now been pushed out by newer and better models. However, they’re still worth a look. 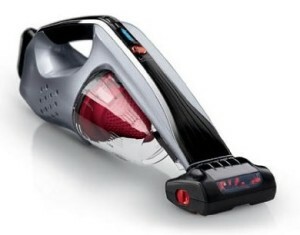 Here’s another fantastic pet hair handheld vacuum by BISSELL, and just by looking at it, there are a few notable differences when compared to the 33A1. 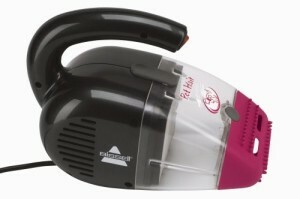 The BISSELL Pet Hair Eraser 94V5A has a smaller mouth, but longer design which makes it easier to reach into tighter spaces, and the handle features a soft grip for comfort. The 94V5A still retains the rubberized nozzle but the crevice tool is handily built-in. It’s also a cordless handheld vacuum that includes a wall mountable charging base, which is a bonus since many cordless hand vacs don’t have this useful option. Unfortunately, it has a standard filter instead of the HEPA Media filter that the 33A1 has. It’s slightly more expensive than the model above, which some users find more effective. But if cordless convenience is a priority for you, then it’s worth paying the bit extra. 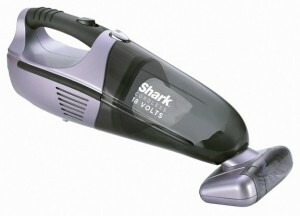 Shark’s range of handheld vacuums may not please everyone, but the Shark Pet Perfect II (read full review here) is a consumers favorite thanks to its powerful suction, multi-purpose use and easy handling. Its Twister Cyclonic Technology is designed to maintain strong suction and it also comes with a standing/wall mountable charging stand. There are three attachments – Crevice tool for reaching tight spaces, dusting tool and a large motorized brush tool. The last attachment takes the cake. It’s job is to remove pet hair and ground-in dirt from carpets, upholstery and car interiors. Users have found it very effective in doing exactly what it’s designed for.